"I got separated from my siblings... 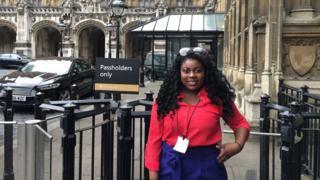 I was told I was moved away from them because I was overprotective with them," 17-year-old Rachel told a committee of MPs on Tuesday.She had come to Westminster to share her experiences of being in foster care, as part of the Education Committee's inquiry into fostering.The MPs heard youngsters in care wanted more support to keep in touch with siblings and former friends, as well as more information about the foster families with whom they are placed.Rachel told MPs it was very important to keep siblings together and when she looked back on her situation, she wondered if it could have been dealt with differently. "I was told I was moved away from them because I was overprotective with them, which in my eyes, as a sister, and you're moving away from home, I feel like it's an instinct straightaway to be protective, because you're moving in with a stranger that you don't know and you have to protect your siblings. "But then I feel that instead of separating me from them, they could have done some work with me to say, 'The foster carer can look after your siblings,' or like tell me I don't need to do everything for them and I don't have to put a barrier up - they could have given me time to settle in so then they didn't have to separate us. "But they separated us and then I wasn't allowed to see them for a long period of time because they said that I was giving my little sister a lot of bad memories and bad thoughts, and I was thinking, 'Have you actually sat down to question her whether she's crying because she misses me or whether she's crying because of this or thisRachel told the MPs that while she now had contact with her siblings, it was only once a month. "We have a bond, but it's not as strong as I'd like it to be and that's quite hurtful towards me, because to lose a bond with your own siblings is sad, because you're by yourself in the world and your siblings are practically your best friends and now you're losing them - you've lost your parents and then your siblings, and it's like your whole world has crashed down really quite quickly." Connor, 14, told the committee of MPs that when he had been moved from one placement to another, he had been given no background information about his new home and had found this very stressful. "I didn't get much info about about the carers I was going to be with, about what the household's like - is it comfortable, is it warm? and stuff," he said.Asked if he had had any choice in the matter, he said no. "I just got told the carer's name, didn't get told what they like doing, I didn't get a booklet, a prepared booklet, from anyone. "They said that it was 'on emergency'; the carer that I was with said to me she didn't get much info on me either - the only thing she got told by the local authority was 'Can you have a 12-year-old boy on emergency? '"They said it would be for a couple of weeks until they could find a suitable placement, but I was there for nearly a year with nothing to nudge me on that I was going to be there for a long time. "So it was very stressful, very upsetting for me, but I've learnt to expand beyond that now and cope with it and cope with the stress - it's been a bit of a rollercoaster for me. "Connor said things could be improved if local authorities gave both child and foster carer more information about each other. "So that I can feel more comfortable in a home with someone that I don't know, but have got info on, so I can know what they like doing, how they are, what they're like and stuff," he said, "that's how I'd improve it. "Rachel added that her second placement had been a little easier, because she had met the foster carer in advance. "I got to go out with her, go to lunch with her, go shopping with her, meet the house, meet other people in the house, so I liked the way they did that with me because they were setting up a full-time placement with me, so they let me settle in with her before I moved straight in, which I feel they should do with most individuals or young people before they just send them off. "On that first day when I moved in with the new foster carer, it was quite unnerving because you don't know who they are, you don't know what to expect, you don't know what it's going to like, you don't know what they're like or anything like that." Speaking to the BBC after the committee hearing, Connor and Rachel - who are both ambassadors for the charity Action for Children - said they felt sharing their stories with MPs at Westminster had made a real difference. "I feel we've made a massive difference. I think we've put them on the back foot and made them realise foster care in England isn't going as planned," said Connor. "This is the biggest experience of our lives, to put our points across to the people who can do something about it. "Rachel said the whole experience was "amazing" and had inspired her to think about a career in politics. "I want to become an MP now and get there in my own steps. I could go into that - I've set my goal high."